More information about how Industrial Heaters work in this link. 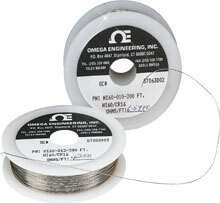 OMEGA™ NIC60 wire is a resistance heating wire comprised of 60% Nickel and 16% Chromium. NIC60 wire is commonly used for heating at temperatures up to 1000°C. This encompasses most domestic heating appliances and those heating units of medium temperatures which do not require the unsurpassed quality of NIC80, the 80% Nickel-20% Chromium alloy.